Books such as Second Helpings provide an opportunity for parents to discuss the challenges of adolescence with their teens, according to author Megan McCafferty. Although McCafferty stated banning a book was probably not the best way to deal with a controversial book, she did agree that parents should be involved in the reading choices their teens make. McCafferty said the first step should be for the parent to read the book. “If a parent finds the content problematic then it is by all means his/her right to discourage his/her child from reading it,” McCafferty said. 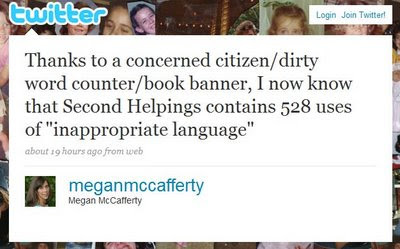 Author Megan McCafferty posted a “Tweet” on her website about Jeff Cline’s comments concerning her book. For more information on McCafferty’s books, visit her website. It isn’t news that the media has a liberal bias—but what about scientists? According to a recent survey by Pew Research Center, 87% of scientists identify themselves as being either moderates or liberals while only 9% of scientists are conservatives. Promoters of Darwinian evolution don’t like it when they are confronted with the public’s desire that both sides be taught on the issue of origins science. They often defend the exclusion of other views by stating that science isn’t a democracy. It sure isn’t—it sounds like they think they are an aristocracy. The survey found that the public’s views on the issue of evolution was “strongly linked to religion.” “The dominant position among scientists – that living things have evolved due to natural processes – is shared by only about third (32%) of the public,” the survey stated. Among scientists, 51% believe in God or a higher power while 95% of the general public believes in God or a higher power. Should the “aristocracy” decide what is taught in the PUBLIC classroom? Knox County Common Pleas Judge Otho Eyster said he only has jurisdiction to compel the attendance of a witness when the person refuses to comply with a subpoena. In the case of Mount Vernon school board members, they were not refusing to comply because they had already “quashed” their own subpoenas, Eyster stated. In his ruling on Tuesday, Eyster gave no explanation as to the legal reasons for the board being able to dismiss their own subpoenas. Mount Vernon News reporter Pamela Schehl has written an article—“Judge explains denial in Freshwater case”—that gives further details on the judge’s decision. “First, he explained, to quash a subpoena means it’s as if it never existed,” Schehl wrote. The judge is credited as saying that his ruling had nothing to do with the appropriateness of the board choosing to quash the subpoenas—it’s a matter of them simply being able to quash. “Since the matter is an administrative hearing, the judge said, the board has the legal authority to issue and quash subpoenas,” Schehl wrote.